Shigeru Miyamoto, Nintendo’s famous Wunderkind and creator of many of the company’s iconic mascots is famously quoted to have said ‘A delayed game is eventually good, but a rushed game is forever bad’. The long-awaited Pikmin 3 originally announced way back in 2008 by Miyamoto-san himself, serves to prove this axiom, though not without its share of minor flaws. Pikmin 3 immediately goes to great lengths to accommodate new players by eschewing Captain Olimar and Louie (established characters in the Pikmin series) as playable protagonists replacing them with three new characters. 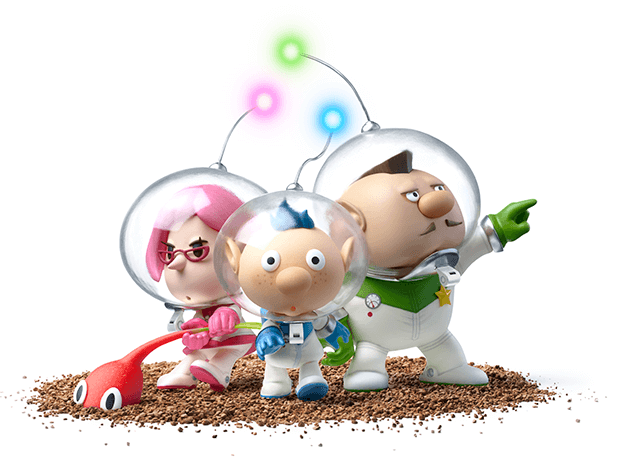 Alph, Brittany and Charlie the new faces for Pikmin 3 are dispatched to the mysterious planet PNF-404 in search of a new source of food for their starving homeworld. After a malfunction when attempting to land the ship, the three explorers are separated forced to rely on both their own wit and the eponymous Pikmin to regroup and collect enough fruit before starving whilst also retrieving the wayward necessary component of their ship required to return home. When writing for this Pikmin 3 review I nothing the he pacing of Pikmin 3 is exceptional, providing a linear and simple opening sequence that branches out quickly into an open-ended experience. 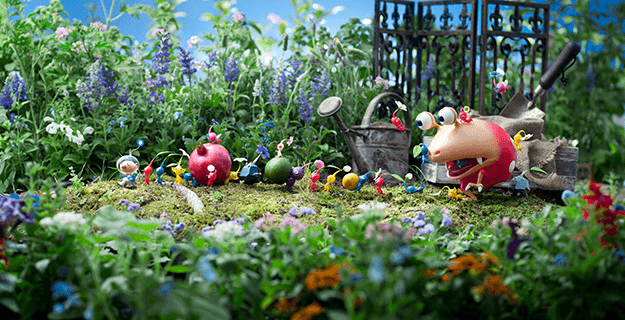 Each Pikmin brandishes their own abilities and characteristics in accordance with their colour, but at the outset of the game only one kind of Pikmin is available forcing the player along a pre-determined path and making the early moments of the game accessibly straightforward. However, after this brief opening section explaining the game’s controls Pikmin 3 becomes a robustly open-ended title – once new Pikmin are retrieved to overcome the various obstacles found along the way, the player is free to prioritise their tasks as they see fit. The game presents frequent suggestions on which locale to visit next (retrieving your team-mates as soon as possible is encouraged but not outright required at first), allowing the player to acclimatise themselves with each area at their own pace. Collecting fruit is both the overall goal of the protagonists but also required for progression; as one jar of fruit juice is consumed at the end of each day the responsibility of managing both food collection with squad-mate retrieval falls to the player. Once all three members of the team are rescued and more variations of the eponymous creatures are at the player’s command, Pikmin 3 really shines. Pikmin 3 is a fantastic blend of multitasking, strategy and action, each step empowering the player whilst also increasing the challenge provided with new environmental obstacles and enemies. Many puzzles in Pikmin 3 require using the three heroes in tandem; lobbing your cohorts and their accompanying Pikmin over impassable gaps or managing two sides of a see-saw mechanism require critical thinking and planning whilst separating into smaller groups allows the player to use multi-tasking to effectively optimise their time given. Each character and their squad can be automatically dispatched to a location by pointing it out on the Gamepad – the ability to move each troop separately without player control encourages micro-management, further bolstering Pikmin 3 as the most strategic game of the trilogy. As each excursion has a time limit by which every Pikmin must be returned to base careful management of time remaining and squad location is important. If any of this sounds too complicated, take heart – many of the trickier puzzles are entirely optional, but helpful hint icons littering the map bring welcome advice to the player without much of the tutorial-based hand holding many have come to expect from modern games. Combat itself can be construed as a series of individual puzzles – many of the indigenous creatures of the Pikmin planet have certain weakspots, or are countered most effectively by certain colours of Pikmin leaving the player to deduce the best counterattack for each enemy. Early on in the game most creatures can be overwhelmed by the sheer size of your Pikmin armada, but later foes (and the bosses in particular) require greater strategizing and forward-thinking. The large-scale boss battles are fantastic if not slightly overwhelming – directing individual Pikmin can become rather frustrating in the fray, especially when faced with aerial foes due to the inconsistent targeting system. Enemies can be locked on to using the Gamepad’s R button, but doing so can prove difficult in the heat of the action as orienting the camera to achieve this can prove tricky. Those familiar with the Wii Remote controls of Pikmin and Pikmin 2’s New Play Control releases on the Wii will be pleased to hear this control scheme returns in Pikmin 3 – although using the Gamepad is recommended for newer players due to simplicity, the option is most welcome. Beyond some slight targeting issues, the default Gamepad controls are fairly intuitive, with the face buttons being used for throwing or disbanding Pikmin troops while the back triggers are used for switching and calling them back. Pikmin 3 is a fantastic game from a visual standpoint, and certain segments of the game serve as a great example of the Wii U’s capabilities. Water effects in particular are natural and impressive from the calm streams traversed by floating lily-pads to the fruit juice sloshing around in glass jars after being harvested. Pikmin 3 allows the Gamepad to be used as a first-person view to take pictures using the gyrometer, which is mostly useless from a gameplay perspective but serves as a great method in which to marvel at Pikmin 3’s many lush environments. If there’s one complaint, however, it’s that a small amount of textures used are clearly muddier than perhaps those on a HD system should be – the implication here is that these are left over from Pikmin 3’s long development cycle, and perhaps should have been replaced closer to release. These artifacts of lesser graphical technology are fairly infrequent but it is a shame to see such a beautiful game let down by a small number of lacklustre textures. The music is tranquil and fitting of the setting – calm and relaxing, but with an underlying sense of urgency. In the proximity of an enemy further percussion is added increasing the tension and providing further impetus on the player to take action. The characters are voice-acted but speak in a garbled gibberish; adorable in it’s way and entirely apt for the tone of the game, but those hoping for a more serious framing with full voice-acting may find themselves feeling patronized by the indiscernible yammering. The Pikmin sounds are spot-on, with their endearing squeaks under command perfectly contrasted by their remorseful cries upon death, while the enemies vary from charming to downright disturbing. In space nobody can hear Pikmin scream. Except for you, unfortunately. Pikmin 3 does a remarkable job of providing a simple accessible introduction to what should otherwise prove quite a complicated game. Units must be managed into squads based upon their abilities, the obstacles they are attempting to tackle and any potential enemies in the area, whilst the constant pressure of amassing more food looms over the player. However, the charming presentation and careful pacing of the game never allow even a newcomer to be overwhelmed, and Pikmin 3 always provides the player with just enough information to make informed decisions without giving away too much. While the game is over if food reserves run dry, any previously played day can be reattempted from the beginning, meaning it is impossible for the game to truly be ‘lost’ and unfinishable, a complaint often levied at the original Pikmin on the Gamecube and it’s strict time limit. The main campaign is fairly brief although collecting all the fruit hidden around each level proves a much more daunting and lengthy task than simply completing the main story. 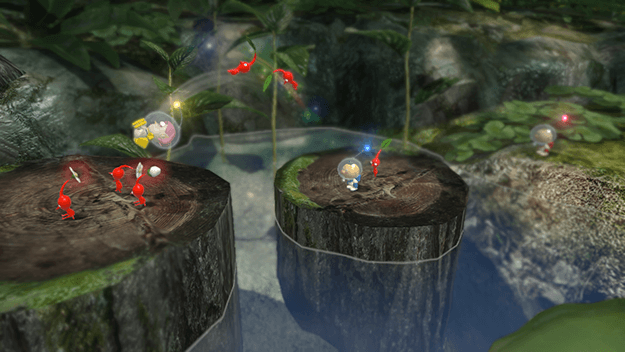 Pikmin 3 contains two additional modes to bolster the game’s content, an extra single player component named Challenge Mode, and a 2-player Battle Mode. Challenge Mode tasks the player with amassing as much treasure as possible within a given time limit, tasking one with both the retrieval of valuable objects with the management of Pikmin numbers. Challenge Mode is surpisingly compelling, frequently goading the player into having ‘just one more try’, with those of you likely to compete with friends for high-scores undoubtedly taking the most from this diversion. The multiplayer component is similarly robust, serving as a competitive spin on Challenge Mode’s collection-centric formula. Each team is charged with retrieving specific items from a range of objects (presented as a Bingo card, with the winner being the player who first completes a line). As some of these items overlap onto both players’ cards, each attempted conquest can result in a struggle for power, and as such careful management of time into both amassing new troops and collecting more objects is important. These games can be fairly brief and, due to the random assignment of required items, occasionally can feel somewhat unfairly biased towards one player. However, each battle is frantic fun, and although the game may be too complicated to usurp Nintendo Land as the go-to Wii U party game, it undoubtedly has enough charm and depth to become a favourite amongst those willing to learn its intricacies. Ultimately, there’s a lot to be said for what Pikmin 3 does well, which is frankly a large percentage of the package. The game (for the most part) looks phenomenal, while the deep, engaging strategic gameplay is presented in a friendly manner that welcomes new players as much as series veterans. The main storyline provides a healthy amount of challenge without being frustrating, and the auxiliary modes are well thought out and serve as a substantial addition to the experience. Some graphical shortcomings and a campaign that ends perhaps a little prematurely keep the game from achieving perfection, but Pikmin 3 serves as a compelling argument for purchasing a Wii U, and a fantastic experience that anyone can enjoy. Let’s just hope we’re not waiting another five years for the sequel.